This one... or this one? Let's face it, the first thing that attracts most of us to monorail is appearance. Many monorails look cool. When we go to a Disney resort and one of those dolphin-nosed trains rolls in, many of us have the same reaction, "Wow!" It's only after we study monorails at length that we find out there are many more advantages than they look pretty. Looking pretty has arguably been a hindrance to the advancement of monorails, especially to those who can, through their profession, see that they are built. They are seen as "Mickey Mouse" trains with little capability in the real world. Even so, the public likes what they see when a sleek monorail cruises by, and we like what we see when we study monorail in depth. While Disney and Las Vegas monorails are good examples of people-pleasing monorail design, the Japanese have to this point gone down a path of what could be described as functionality-first design. While blunt noses are good for train-to-train evacuations and tall trains allow no protruding wheel casings in the passenger cabin, they present challenges for stylists. 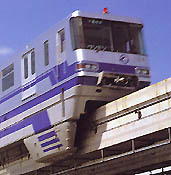 It's difficult to make a sleek train with some of the requirements of the Japanese monorail standards. When I first starting researching monorails in 1988, I remember the moment clearly of discovering that a new monorail system had opened in 1985. I was looking through Jane's World's Railroads and came upon a picture of the Kitakyushu Monorail. I was excited to find out that monorail was still considered by someone to be worthy of building, yet at the same time I was disappointed with the tall, boxy look of the train. In my research I was hunting for evidence that monorail is indeed functional as a valid rail mode, yet I still desired that the trains look attractive as the Disney trains many of us have grown up appreciating. As I made my first trip to Japan in 1990, I witnessed firsthand the boxy trains of both straddle and suspended monorails. 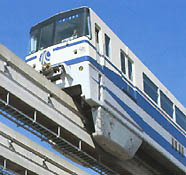 Better-looking trains operate on the 1964-built Tokyo-Haneda Monorail. Those trains are built on the model of original Alweg specs, which aren't as tall and can be made to look better a bit easier. Japan is still Monorail Land, and they continue to refine and improve their systems. The Tokyo Disney Resort Line opened in 2001 with more stylish trains, although the Mickey Mouse-shaped windows don't exactly help us sell monorail as serious transit. They're cute though and fit their locale. 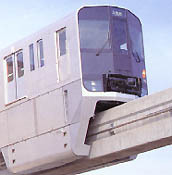 The Okinawa Monorail has an improved design with rounded front windows. 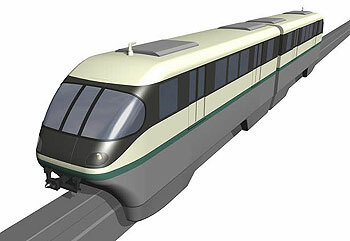 The two-car Hitachi train retains the high floor standard with train-to-train evacuation capabilities, yet the train is more stylish looking than previous full-sized Hitachi trains. I hope this is a trend. If Hitachi intends to sell their monorails worldwide, they will find that customers prefer functional AND good-looking trains. I wouldn't be surprised if some of the box cars of Kitakyushu, Osaka and Tama are someday replaced with better looking trains as well. Then there is paint! The Seattle Monorail Project received considerable criticism for their train design before the project was cancelled in 2005. It was not seen to be the sleek, futuristic design that excited Seattleites in the earlier days of the project. I urged designers to go back to the drawing boards to make the trains look more attractive. Unfortunately, their art rendering continued to show a drab off-yellow, black and dreary gray design (left below). 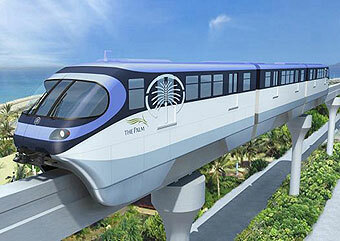 About a month after the cancellation of the Seattle Monorail Project in 2005, an announcement was made that The Palm in Dubai would feature a Hitachi Monorail System. Virtually the same train that was proposed in Seattle had suddenly become a much better-looking train, and without any structural changes to the design! A simple change of color scheme made the same train look much more appealing to the eye. Brighter and livelier colors are featured on the Dubai design and the height of the train has been cleverly minimized with creative balancing of the color stripes on the side of the train. 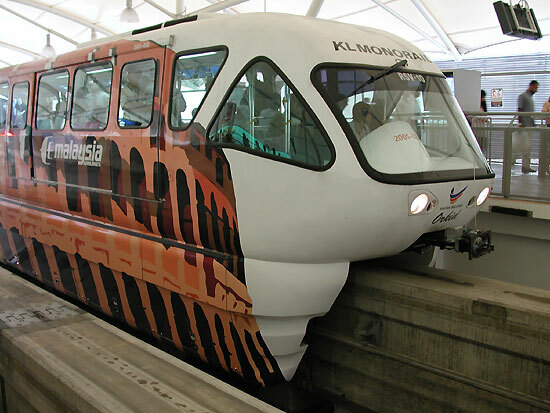 When it comes to looks, one system that I really like is the Kuala Lumpur Monorail. They have taken the classic Alweg design and beautified it for a perfect match to their modern skyline. Not only are the trains slick looking, but the guideway is a mix of the traditional Alweg track with that of the graceful arched track of Disney-developed monorails. Their train sides aren't all-flat walls as Japanese trains have, they have appealing "shape" to them. Good looking guideway and trains are not only be appealing to the eye, but hopefully they will entice other cities around the world to take notice. Having visited the Kuala Lumpur Monorail system in person, I can say this is an ideal example of modern monorail in an urban setting. Looks aren't everything though, and I have made points about this in our Seattle Center Monorail photo essay. 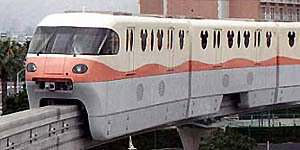 Disney/Bombardier Monorails, it could be argued, are the best-looking monorail trains in the world. However, they are based on the original scale-sized monorails of the Disney resorts and have limitations as a result. The biggest limitation is the inability of passengers to walk from one end of the train to the other. This can pose safety and operational problems. The Disney/Bombardier MVI design is also currently limited to around 50 mph, while the 1961 Alweg trains of Seattle, if given longer track, can easily exceed this speed. So while they are great looking trains, Bombardier's MVI isn't the most capable of transit-capable monorails. However, Bombardier did come up with a vastly-improved design for the now-defunct Seattle Monorail Project. That design eliminates the MVI limitations, but it remains to be seen if they will propose that design elsewhere. Wherever they are built, I hope to see future monorails that are a good mix of functionality and are every bit as capable as the original 1950's monorail designs. And since looks matter, it certainly wouldn't hurt if they look cool too.